Nokia 5233 Insert Sim Card Problem Repairing Solutions are available in the following article. Also you will find Nokia 5233 Insert Sim Ways and Jumpers information in the diagrams further in this post. 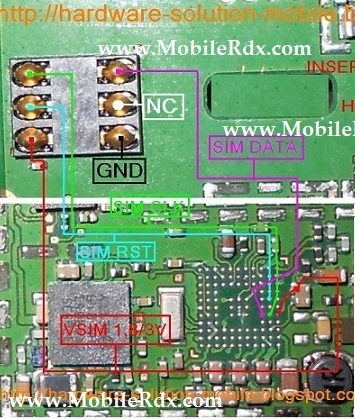 In Nokia 5233 Insert Sim Problem can occur because of the faulty Sim Card Connector, Sim IC or it’s bad connection to the Cell Phone’s Motherboard. Bad connections can happen for many reasons like if it’s dropped or got wet, bad connection may also happen because of Carbon, Rust or even Dirt. So first of all you should clean Nokia 5233 Sim Card Ways, Sim IC, Sim Card Connector and Motherboard of the Mobile Phone. You Can Use any cleaning liquid for this purpose like CTC or any other you prefer. If you are certain that the bad connection is not the reason for your Mobile Phone’s fault, then you can replace the Sim Card Connector. Here i wish to add some manual steps to bypass insert sim message on your mobile phone.